For the first time in its 54-year history, the Santa Barbara Zoo will exhibit reindeer, on view only this holiday season from Wednesday, November 22, 2017, to Monday, January 1, 2018. Two male reindeer, an adult named Holiday and a first-year calf named Lightning, will take up residence on the lawn opposite the Cats of Africa exhibit for holiday viewing. Winter-themed and holiday-related activities take place throughout the season, and Santa will be available for gift requests and photos on Wednesdays through Sundays from November 22 until Christmas Eve, December 24. There is no extra charge to view the reindeer. The Zoo is open with the special hours of 10 a.m. to 3:30 p.m. on Thanksgiving, Christmas Eve, and Christmas Day. It is open regular hours, 10 a.m. to 5 p.m., on New Year’s Eve and New Year’s Day. Lightning and Holiday allow the Zoo to help answer questions from local children such as: Do reindeer really exist? What’s the difference between a caribou and a reindeer? Do both male and female reindeer get antlers? What’s the difference between antlers and horns? How big are their antlers? Do they make sounds? Can they fly? 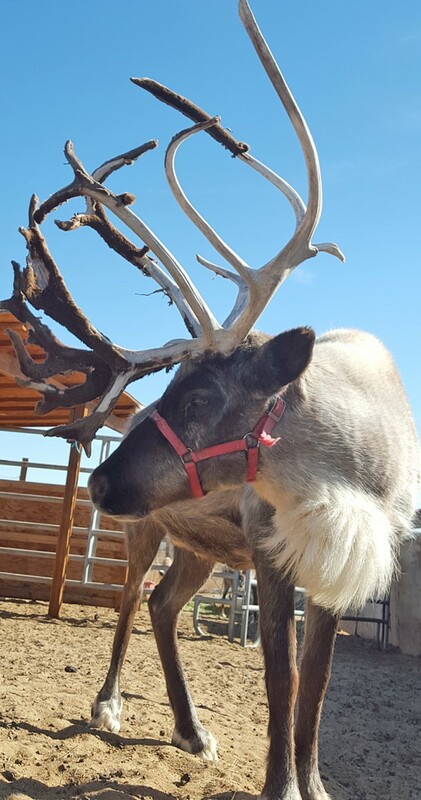 The two reindeer are on loan from Windswept Ranch, located in the foothills above Antelope Valley near Tehachapi, California. The facility is home to a collection of animals including camels, llamas, zebra, alpacas, sheep, goats, horses, deer, and reindeer. Many of the animals have been rescued or rehabilitated. For more information, visit www.capettingzoo.com. A pair of Asian small-clawed otters at the Santa Barbara Zoo have produced their first litter of pups with three healthy offspring born in a nesting box in their holding area on Saturday, October 7. As in the wild, where the parents keep their pups in a den, these young otters will not leave their behind the scenes holding area until they are old enough to safely swim and have grown teeth so they can eat solid food. Depending on their development, keepers estimate the pups could go on exhibit as early as mid-December. Animal Care staff had recently confirmed that Gail was pregnant and estimated that she was due any day. When keepers arrived Saturday morning, Gail and Peeta remained in the nesting box. Gestation is 68 days, and after birth the female stays in the nesting box with the pups, but is relieved by the male for breaks. Both of the Zoo’s otters are first-time parents, but are showing excellent parenting skills for the two pups (females and one male), according to keepers. Peeta was born at the National Zoo in Washington, D.C. in 2008. Gail was born at the Greensboro Science Center in South Carolina in 2013. The two were paired as part of a cooperative breeding program of the Association of Zoos and Aquariums (AZA). Their names, inspired by characters in the popular “Hunger Games” books and movies, were given to them by their Santa Barbara Zoo sponsors Peter and Pieter Crawford-van Meeuwen. 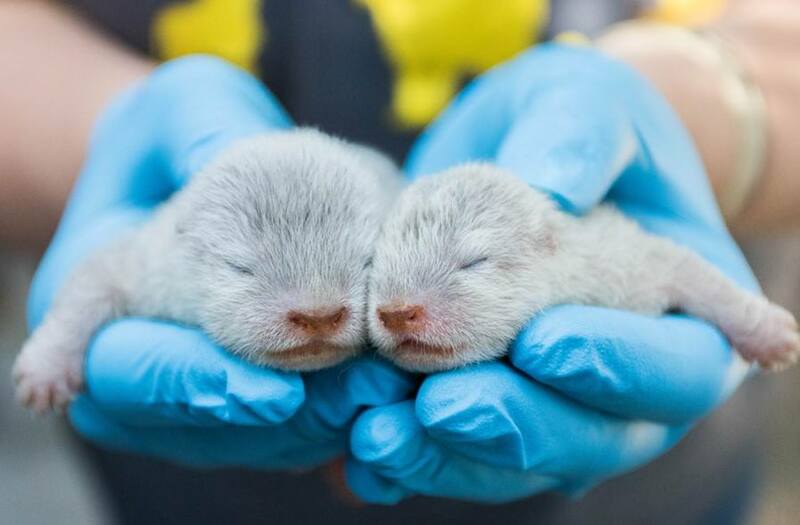 The last time Asian small-clawed otters were born at the Zoo was in May 2011 when six pups were born to a pair named Jillian and Bob. That pair also produced five young in August 2010, the first of the species to be born at the Zoo in more than 20 years. The entire family group later moved to the National Zoo, where they live today. Another female, Katniss, was paired with Peeta, but they did not breed. She passed away in December 2016 from a kidney ailment. When Will the Otter Pups Go On View? Asian small-clawed otters usually keep their pups in their dens for several weeks until the young have learned to swim and have teeth to eat solid food. Green estimates that the family group may venture into their exhibit in December for swimming lessons in the small pool. By January, the pups should be proficient swimmers, and on view at varying times during the day. By spring, they could be diving in the larger pool. “It all depends on how quickly the pups pick it up,” says Green. The public can help the otter pups by becoming a Foster Feeder, which supports the cost of feeding the growing otter family. New otter Foster Feeders who donate at least $50 receive a custom otter plush embroidered with the Zoo’s logo, along with a Foster Feeder certificate, otter fact sheet and photo, recognition on the Zoo’s Foster Feeder board and in Zoo News, and a one year subscription to Zoo News. Although this species is not listed as endangered, Asian small-clawed otters are seriously threatened by rapid habitat destruction for palm oil farming and by hunting and pollution. They are considered an “indicator species,” meaning their population indicates the general health of their habitat and of other species. This species, the smallest otter in the world, lives in freshwater wetlands and mangrove swamps throughout Southeast Asia including southern India and China, Indonesia, the Philippines, Borneo, and the Malay Peninsula. They prefer quiet pools and sluggish streams for fishing and swimming. Unlike sea otters, they spend more time on land than in water, but they are skillful, agile swimmers and divers, with great endurance. They can stay submerged for six to eight minutes. Asian small-clawed otters are about two feet long and weigh under 10 pounds, less than half the size of North American river otters. Their claws do not protrude beyond the ends of the digital pads, thus their names, and their feet do not have fully developed webbing and look very much like human hands. They are one of the few species of otter that live in social groups. The bond between mated pairs of Asian small-clawed otters is very strong. Both the male and female raise the young and are devoted parents. In the wild, Asian small-clawed otters live in extended family groups of up to 12 individuals. The entire family helps raise the young, which are among the most active and playful of baby animals. For additional information visit: www.sbzoo.org.